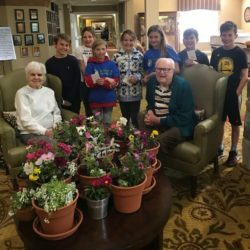 It was a great day at Brookwood Retirement Center and our 4th grade GOODNESS GROUP bringing youthful smiles and flowers to a big group of seniors! What an amazing day at Glide Memorial! We are so grateful for our friends at Clif Bar for donating 3 cases of bars to the homeless! The recipients were incredibly grateful! Thank you Clif for sharing this gift. You are amazing people with an incredible heart! As 2017 draws to a close, we are filled with gratitude for your support of our mission… Our Pledge to Humanity! Please check out our year-end newsletter and see all the ways your support has benefited our community over the year. Athenian Pledge to Humanity went to the Women’s Daytime Drop-in Center today. 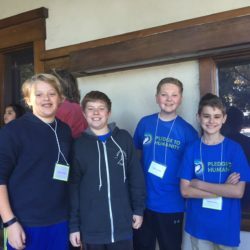 They helped serve Thanksgiving food, clean up and talk to everyone there. 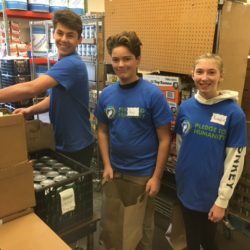 PTH Gratitude Packs Thanksgiving Boxes at Shelter Inc.
PTH Gratitude spent their day sorting and making Thanksgiving boxes for about 200 families. The boys worked really hard and were great sports. THey also talked about Shelter Inc’s mission and how our morning’s work would benefit so many families in need.